Having been a Linux user for a number of years I tend to find it somewhat frustrating when using the Windows Command Prompt. Microsoft shows no sign of making any changes in this area even though it's an essential tool for any IT worker, especially software developers. At the least I tend to have Cygwin, Git-Bash, and a couple of instances of the Command Prompt open while working. At home I tend to use either a Mac or some GNU/Linux variant so it's simply a case of opening a new tab in the terminal emulator when I need to. This is something that ConEmu can take care of. Not only can it allow for tabbed instances of the Windows Command Prompt, it will work for other terminals as well. It was recommended to me today by my boss who was looking for a better way to use the Command Prompt in Windows. I'm currently using it just to help managing the various dev tools I use. So Cygwin, PowerShell, Git-Bash, and the CMD are all available in the same place. 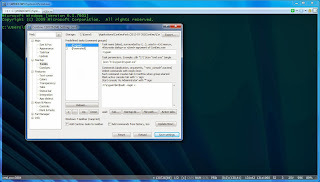 To make a console such as Cygwin available within ConEmu simply open the settings and add a new task. So now I have all of my command line tools running within one window but it doesn't stop there, ConEmu has tons of features so go take a look.